Drum major Claire Albrecht conducts during a June rehearsal of The Cadets. Claire Albrecht played just one note, on clarinet, in her very first marching band production with Franklin High School just outside of Nashville. By trade, she was a flute player. For that season, the fall of 2010, she had been tabbed as an “alternate.” According to Albrecht — who was asked to fill a spot on clarinet — she learned to play the initial impact of that year’s ballad movement, and nothing more. Eight years later, she technically doesn’t even play a single note. Instead, she’s in her third year conducting a 10-time DCI World Champion drum corps. 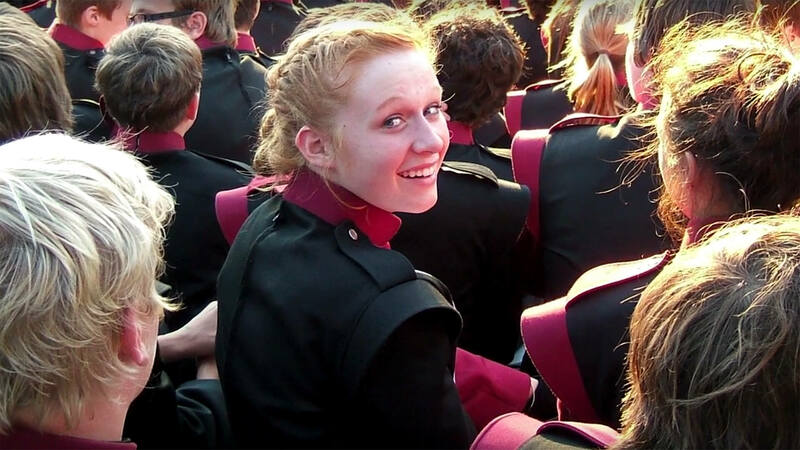 When Albrecht entered the Franklin High School band program, she did so to continue spending time with friends of hers who were interested in marching music. Taking over the role of an alternate wasn’t the most welcomed way to start that experience, but things improved from there over time. Off the field, though, in her role as an alternate, Albrecht was asked to assist the school’s drum majors, logistically speaking. Through that opportunity, as someone brand-new to the marching arts, she found role models. Moreover, she found inspiration. Working alongside experienced juniors and seniors gave Albrecht a new perspective. 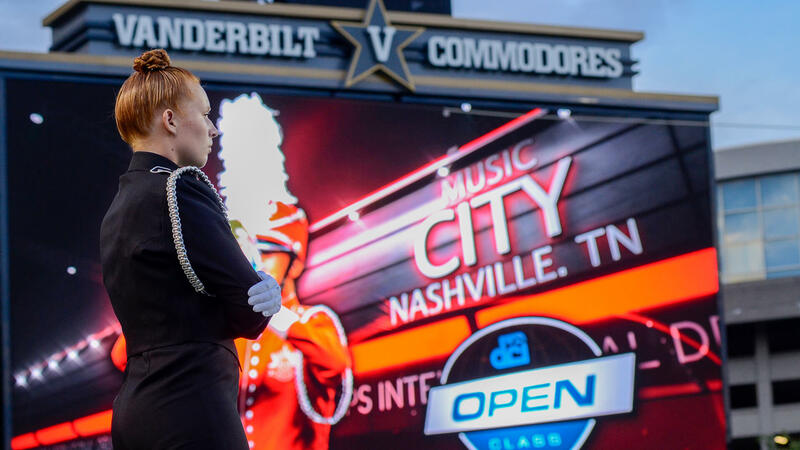 Albrecht credits watching the 2013 DCI Tour of Champions series event in Murfreesboro, Tennessee as a seminal moment in her budding drum corps career. When her senior year rolled around in 2013, Albrecht moved into the position of drum major with her band. 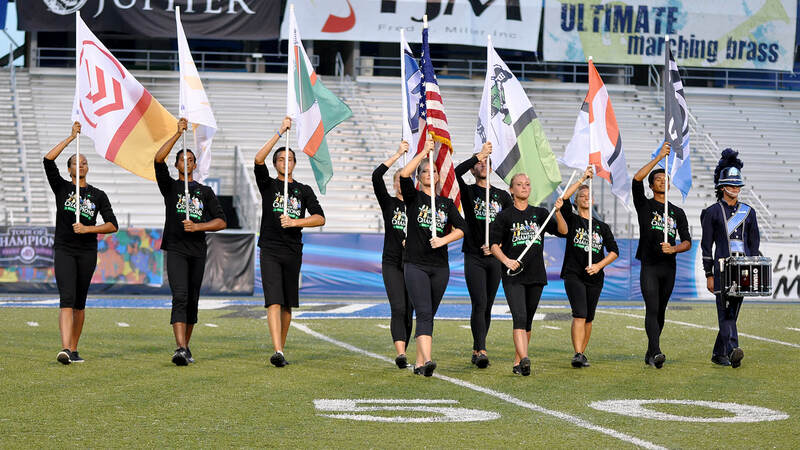 That summer, she had experienced drum corps for the first time, at The Masters of the Summer Music Games DCI Tour event in Murfreesboro, Tennessee, which featured each of that year’s top seven scoring corps. During summer band camp, Albrecht joined a team of conductors at Franklin High School who were taught by Billy VanDelinder, the drum major from Phantom Regiment’s bronze medal-winning 2012 season. VanDelinder, back at the start of his own drum corps career, had been a drum major at his and Albrecht’s hometown drum corps, Music City. By that point, she wasn’t entirely sure how, but Albrecht knew she wanted to do the same. VanDelinder pushed her in the right direction. Albrecht stands on the drum major podium with Music City during the corps' 2014 season. In her own words, Music City was a “cartwheel” away from where Albrecht lived. 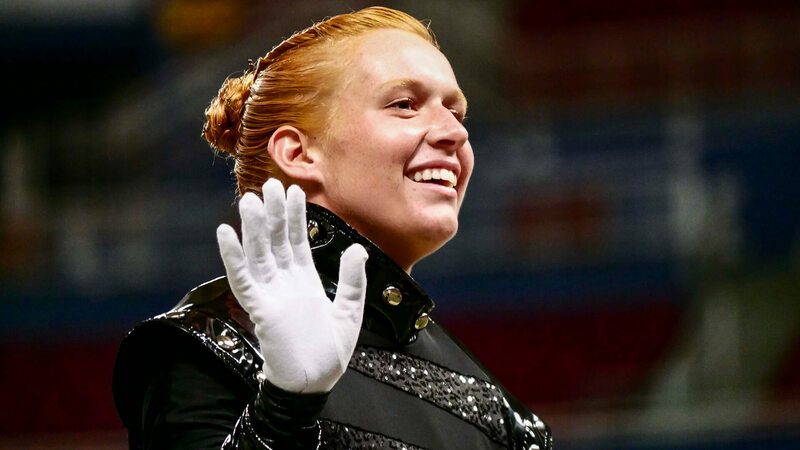 The corps was beginning preparations for its sixth season in Drum Corps International’s Open Class division when she decided to audition — and, ultimately, be accepted — as a drum major. After a second season with the Nashville corps in 2015, Albrecht knew she was ready to take a shot at joining a World Class corps, which she ultimately decided would be The Cadets. “As a personal goal, I wanted to know what it was like to be a part of some organization with an incredible history, with just excellence written into every piece about it,” she said. She’d seen her future corps’ 2013 bronze medal-winning program, “Side X Side,” in Murfreesboro, and loved it. To this day, Albrecht said, it’s one of her favorites. Further, she knew the rich history that spanned more than 80 years and featured more than 33 top-five finishes since the inception of DCI. It became clear to Albrecht; the next step for her drum corps career was a few hundred miles northeast, in Allentown, Pennsylvania. But it’s certainly not always common for a corps — namely, for The Cadets — to be going outside their current membership in search of drum majors. Ahead of the 2016 season, however, Albrecht found an advertisement for just that. She auditioned, and she was in. For that first season, her role in rehearsals was to handle metronome duties on the back sideline. Albrecht loved it; it was everything she expected The Cadets to be, and so much more, at the same time. 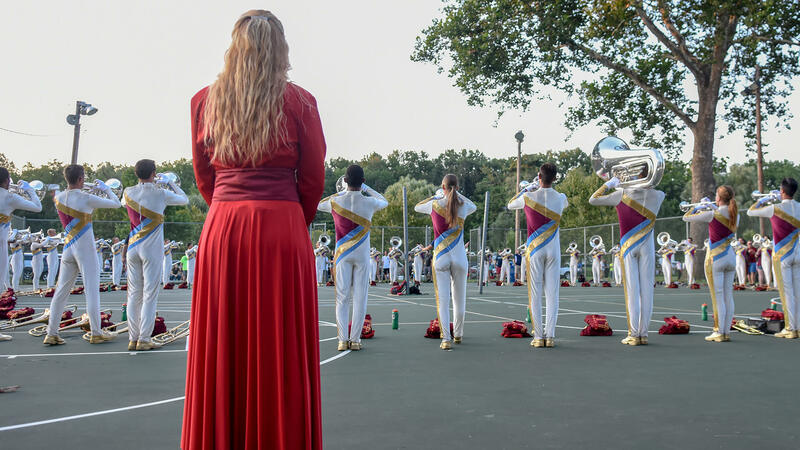 By the time her second season with the Allentown corps rolled around in 2017, Albrecht was front-and-center as head drum major of the same organization she had fallen in love with four summers prior. Albrecht looks on as The Cadets' horn line warms up in Allentown, Pennsylvania in 2017. Luckily for Albrecht, when she leaves the drum corps activity behind, many of the leadership skills she developed as a drum major will overlap flawlessly with her career path, having graduated from the journalism school at the University of South Carolina, with a focus in public relations. 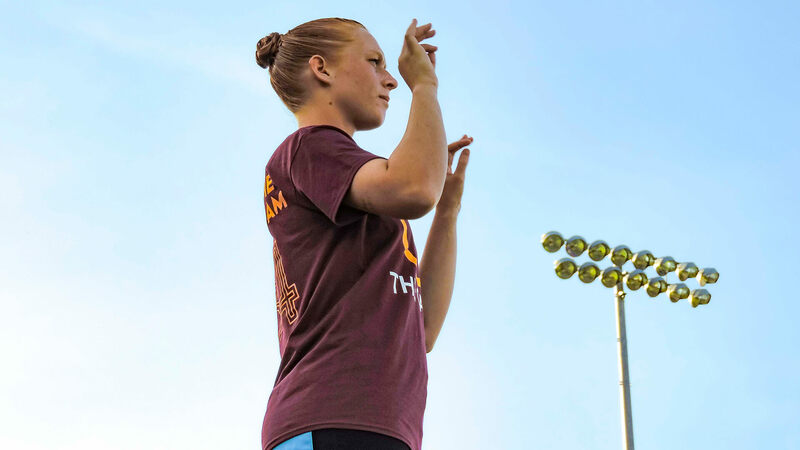 From skills in communication, to the ability to present oneself and one’s organization professionally, Albrecht’s time working as a drum major has aligned well with her chosen career path. Having previously worked as a marketing intern for Indianapolis-based marching arts organization Music For All, Albrecht is looking to use her skills in “the nonprofit scene,” when her drum corps career concludes in a few short weeks. “Definitely, any work with a greater cause attached to it is something that’s really special to me,” she said. Before any of those pieces fall into place, Albrecht has two more weeks with her dream corps. The plan, at this point, is to maximize the few days that remain. Albrecht aknowledges the crowd during the 2018 DCI Midwestern Championship in St. Louis. Five years in the drum corps activity have taught Claire Albrecht quite a lot. She’s seen it all; every type of weather, every type of performance, every type of rehearsal, the good and the bad of it all. She’s learned, through those experiences, first and foremost, that attitude is everything, in any situation. Furthermore, Albrecht’s experiences over the past five summers have taught her a wealth of information about herself. She’s seen what it takes to reach and go beyond her potential in a given discipline, and how to recognize her own successes, as well as the successes of those around her. To have learned all of those invaluable lessons from a corps she’s always wanted to be a part of, from the beginning, makes it all that much more meaningful. And all things considered, Albrecht’s career in the junior drum corps activity will end on a note far more resounding than the one she played on clarinet eight years ago. This note will last a lifetime.